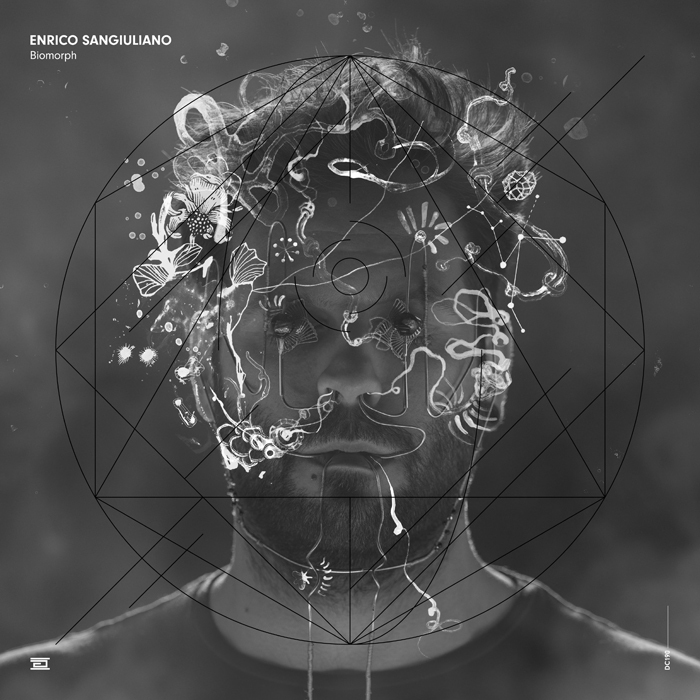 Enrico Sangiuliano has been a Drumcode favorite since his debut track “Trrbulence” with Secret Cinema on A-Sides Volume 3. He blew people away with his solo EPs, Moon Rocks and Astral Projection, which featured some of his most played tracks of all time. Now he makes his return to the label with a project unlike any seen in his career so far. The project is a concept album called Biomorph and is separated into four sections, all telling parts of a story about evolution and the process of biological and technological advancement. Every track shows a new side of Sangiuliano’s masterful production skills, while still retaining elements of the sound he is known for. The first section is Organisms, and opens with “Functional Basic Unit of Life.” This ambient track is a slowly-building soup of synths that mix and layer together, giving the impression of bringing order to chaos. As this piece dies down, it makes way for the thundering percussion of “Multicellular.” This track has been sought after as the opener to the back-to-back set between Adam Beyer and Cirez D earlier this year, and features a prominent sawtooth lead that contrasts with the deeper pads and synth stabs. Finishing the Organisms section, “Generative Model” takes things in an entirely different direction, with a slower broken beat that’s vaguely industrial in nature. A consistent bass and a pulsing synth progression keep things steady while dynamic arpeggios add some more spice to the arrangement. Cosmic Forces features two floorburners which are finely tuned to induce dancing from anyone, anywhere. The first one, “Cosmic Ratio,” uses a breakbeat-backed groove to make something melodic and energetic. Chill-inducing, lightning-like synths ensure that the track is truly unforgettable. “Hidden T” is bound to be one of the most loved tracks on the album. Drumcode’s main man Adam Beyer has been playing it regularly, though the artist and title were unknown until the announcement of this album. It is a deep track, with a long build leading to the break, which is immediately recognizable by a repeated ascending hook. Sangiuliano’s signature percussive synth work is still present, but it takes the sidelines to give a washing pad the spotlight. “Arboreal” opens the Metamorphosis chapter and acts as an interlude. The first minute or so is quite ambient and features a distant snare ticking like a clock. Then all at once, a distorted drum beat breaks in, bringing a feeling of unstable power. This tune contains prominent industrial and drum & bass influences, and showcases a side of Sangiuliano’s work that has rarely been heard before. The music then progresses into “Symbiosis,” one of the most anticipated tunes on the album. This one has Sangiuliano’s very recognizable signature style, with percussion stabs and distorted synths, but he throws a curveball with a three-bar hook offset in timing from the backing drum groove. The break begins at nothing before slowly building up its flurry of synths and then launching into the harsh, resonant bass groove of the drop. The final section is Two Probabilites, which gives a glimpse of the distant future. The first of the two is “New Dawn,” a lovely, slow-burning melodic tune, layered with otherworldly pads, perfectly painting a picture of hope and beauty. In contrast, “EOL” ends the album with a harsh, off-kilter beat and dissonant lead. The track attempts to build in a couple of iterations before collapsing into chaos: a soup of distant vocals and cold atmospheres. Eventually, the beat returns with the sound of the universe being ripped apart, a pure industrial section that shreds and pulverizes its way through the music before coming to an abrupt end. The digital version of the album adds one more tune, a massive driving festival track, called “A Further Existence.” This one is dark and upbeat, driven by chugging synth stabs. Emotional leads and phenomenal subtle details make the track an unstoppable vessel of kinetic energy. The “Biomorph” album is out now on Drumcode.